Trailhead and parking area are at the Waterville Valley Ski Resort in Waterville Valley, NH. To get there, take Tripoli Road off Rt. 49, 10.2 miles from Rt. 93. Follow the signs into the ski area entrance and drive to the uppermost parking lot. The trailhead is on the upper right side of the parking area, facing the ski area. Mt. 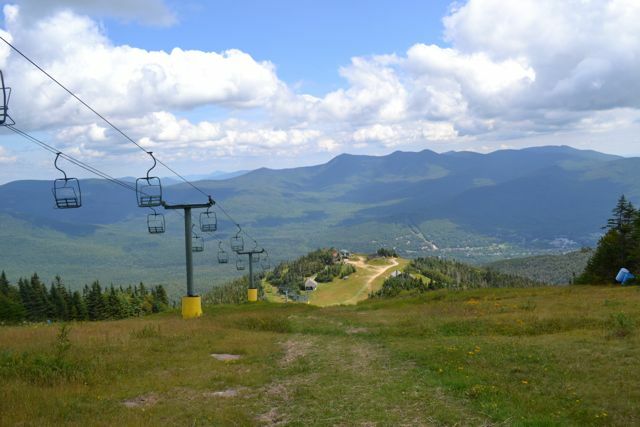 Tecumseh, on whose slopes is the Waterville Valley Ski Resort, is the shortest of all the White Mountain 4000-footers, rising just three feet over 4000. Its sharp, pointed summit offers a directional view to east over Waterville Valley from a view clearing, featuring one of the best up-close views of the Tripyramids in the White Mountains. The Mt. Tecumseh Trail starts at the parking lot for the ski area. It enters the forest and immediately crosses a brook. It climbs at a very easy grade for 0.3 miles before crossing a larger stream, Mt. Tecumseh Brook. The trail ascends for a short distance on the other side, then becomes relatively flat for 0.8 miles before descending steeply to recross this brook. It then begins to climb steeply, starting with some switchbacks. At the first switchback, a spur on the left leads out to a ski trail, where there is a wide view east to Mt. Osceola, Mt. Kancamagus, the Tripyramids, and the Sleepers. After two more switchbacks, the trail continues straight, angling uphill over a rocky surface. After a long stretch of constant climbing, the ascent is aided by a string of nicely built stone staircases. In just under a mile from the last switchback, the trail levels out and joins the Sosman Trail; bear right. The pointed summit is visible ahead. The two trails soon split at the base of the summit cone. Bear left onto Sosman Trail, a slightly easier route to the top. It leadins around the steep slope, and ascends to the summit in 0.3 miles with a few switchbacks. The view from the top is not as wide, but is unique and far-reaching. To the north are nearby Mt. Osceola and East Osceola, with Mt. Carrigain and the Presidentials in behind. To the northeast, just beyond East Osceola, are the Carters and Wildcats in the distance and Mt. Kancamagus in the front. To the east, the view extends to Kearsarge North. The Tripyramids are close by, just across Waterville Valley. The actual town of Waterville Valley can be seen through the trees below. To the south and southeast is the Sandwich Range. After enjoying the summit vista, return the way you came down to where you first joined the Sosman Trail. Here, you can bear right and take the Sosman Trail over to White Peak, the top of the ski area. The trail is half a mile long and passes a viewpoint toward Franconia Notch, a direction not seen from the summit. It is fairly flat and easy almost the whole way. At the end, it passes a communications tower (stay to the left) and emerges at the very top of the ski area. The view is similar to the one from the summit.